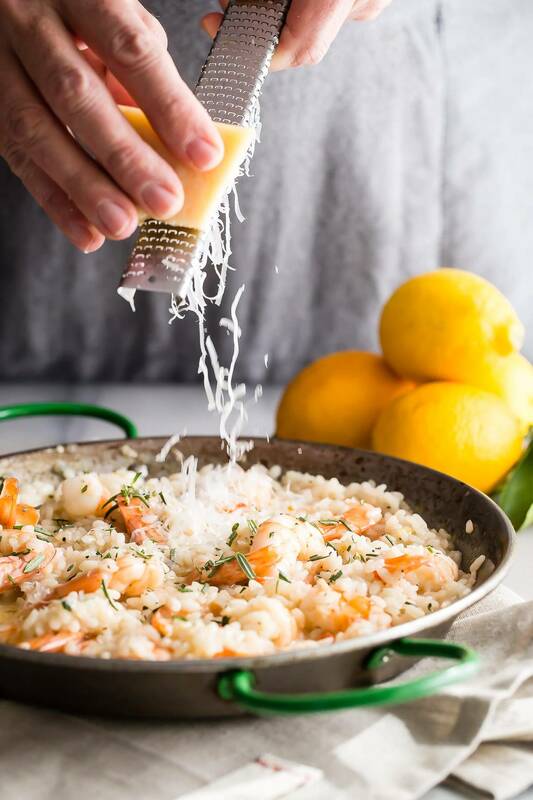 Easy to make lemon risotto with shrimp, cooked low and slow until perfect! 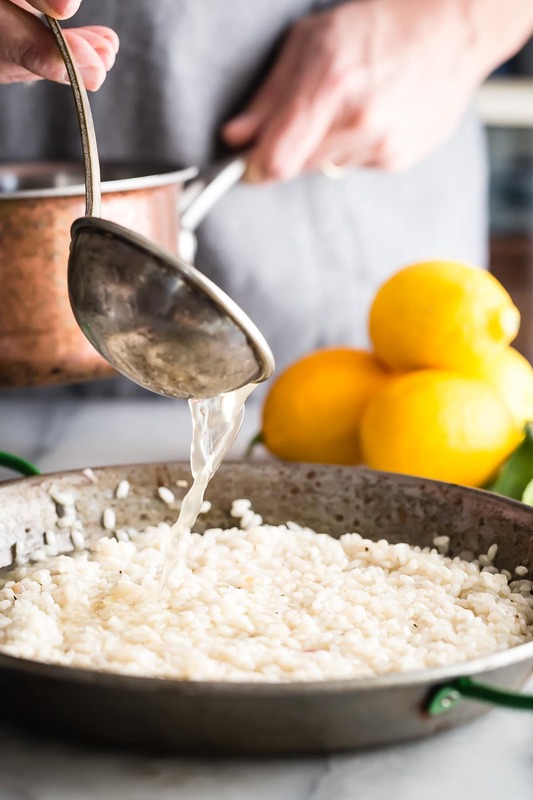 I once heard that making risotto was super scary, and you had to continually stir it from beginning to end or it would end up like little pebbles of burnt rice, a complete disaster. Making risotto is like having a baby. Although I haven’t actually done this, I have seen it go down twice. A little bit of pushing is akin to the stirring of the rice and then a break, to gather some thoughts (or add some stock) before another round of stirring slash pushing. Okay, maybe that’s not the best analogy to use, and I’m sure there’s a hundred mom’s including my wife, would take great pleasure in telling me that babies and lemon risotto have zero similarities. Cooking the perfect lemon shrimp risotto. I guess what I’m trying to say is that making risotto is a slow and gradual process. You definitely can’t rush it but there’s no need to stand over it from beginning to end. Pour yourself some wine and sit close by the stove, taking a peek now and again. Stir every time you add stock and then go back to your wine. 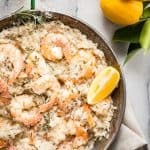 What should my lemon shrimp risotto look like? The end result should be creamy like this Wild Salmon version and still a touch on the liquid side. As the rice cools it might seem to be getting thicker, a quick fix is just to add a touch more stock and fold it through or some butter right before you plan to serve it. I always plan on having more stock than I might need, I’d rather throw away a cup of stock than have a thick goopy risotto because I didn’t plan on enough liquid. Once you taste it and the rice is no longer hard, generously cover with freshly grated Parmesan and juicy shrimp. What kind of rice is used for risotto? Traditionally the best rice to use is arborio rice which is Italian rice variety. It has more starch than regular rice and as it cooks slowly it releases the starch and that’s what gives risotto its creamy texture. Can I use other types of rice for my lemon risotto? Yes, any rice would work in a pinch but just don’t expect the same creamy delicious results though stay away from long grain rice which has a low starch content. 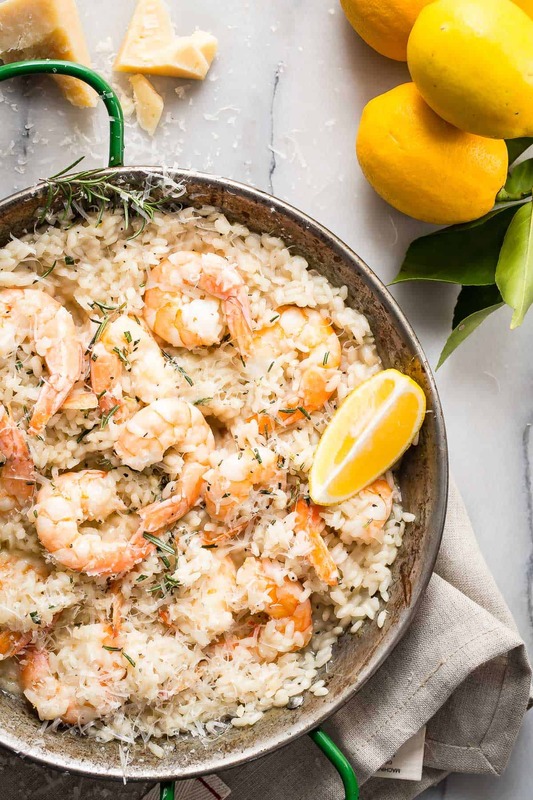 A classic dish with creamy lemon flavored rice and fresh shrimp mixed in. Topped with fresh grated Parmesan this is meal is easy and classy at the same time. Warm the stock in a pot over a low heat. Add 3 tablespoons of the olive oil to a pan roughly 9-10 inches wide over a medium heat. Add the diced shallot to the pan and cook until the shallot turns soft about 2-3 minutes. Pour in the wine and simmer until most of the wine has disappeared and reduced. Add your rice and mix well making sure to coat the rice well with the liquids. When you see the rice turn creamy and translucent, start gradually adding the stock a ladle at a time waiting until the liquid is absorbed before adding more stock. Stir every so often. Turn the heat to medium-low and stir each time you add stock. Slowly simmer the rice. Keep adding the stock and taste the rice, it should be soft but still have a tiny bite to it when it's done. When you have about one ladle of stock left, In another pan heat the remaining olive oil over a medium heat and add the shrimp and garlic. Cook for about two minutes and add the lemon juice. Simmer on a high heat for another 2-3 minutes and the shrimp are pink and cooked through. Add the shrimp to the risotto and gently fold through with the lemon zest. Add the remaining stock making sure the dish is loose and creamy. Transfer to a plate and grate some fresh Parmesan cheese over the top. Garnish with fresh chopped rosemary. I love risotto, what a stunner of a meal! 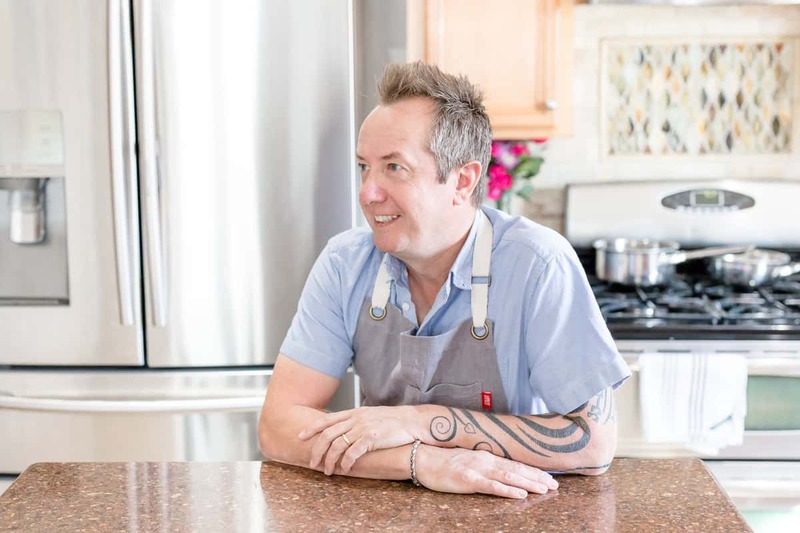 I’ve actually never made my own risotto…so clearly I need to change that! Love that you added shrimp too. Pinned! I can’t wait to make this recipe!! PINNED! This looks incredibly delicious. Beautiful dish! You nailed this dude, looks amazing! Hope you had an awesome birthday! Risotto is one of those dishes that intimidates a lot of home cooks. But your directions and photography are so good, I want to stop what I am doing and go to my kitchen to make this. My usual lemon & shrimp dish is a garlicky linguini, but I am adding this to my list of dishes to try. I make risotto on a fairly regular basis. Usually, although delicious, it is heavier. This was so fresh and light. My almost 2 years old loved it and even ate the shrimp! Definitely a new go to! For how many people is that recipe pleaaaaase ? Hi Celine, this would feed 2-3 or 2 for a main course? Hi Gerry, I made this for lunch today and it was just delicious. Thank you for the great recipe! It will go into my recipe collection. Hi Julia, awesome and thanks for letting me know! Made this for the 3rd time tonight. My SO loves it and keeps asking for it and he isn’t a big fan of shrimp. So good! I had a bunch of lemon basil on hand and subbed it for the rosemary, just as yummy.